Northern Ireland's power-sharing executive is now expected to meet on Thursday - after a stand-off which has lasted more than four months. An internal Stormont memo, shown to the BBC, said the agenda would probably deal with the economic downturn. It also referred to a number of "tick and turn" papers, jargon for issues which need rubber-stamping. 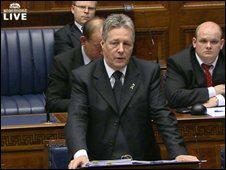 When asked about a possible meeting in the assembly earlier First Minster Peter Robinson did not rule it out. "In circumstances where agreement was reached to hold an executive meeting, it could take place sooner," he said. The executive has not met since June, but party executives met over the weekend hoping to end the impasse. "Tomorrow, Peter Robinson and Martin McGuinness are meant to be bringing a joint report to the assembly committee which deals with policing and justice," BBC NI's political editor Mark Devenport said. "Following the weekend talks, it seems to point to the notion of progress being made and, potentially, an end in sight to this 151-day stand off."